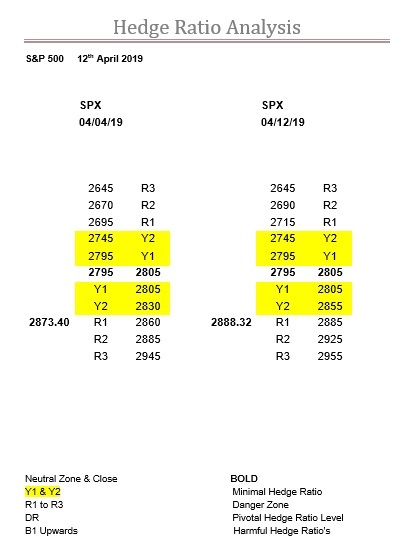 Since our last comment on the 4th it has indeed been all about R2, which back then was at 2885 as you can see in the left-hand column in the above table. Furthermore, exactly as we also said back then (please see above comment), this ratio was slipping, so if you had taken notice then all the price action in this index over the last week would have been perfectly understandable. The top of the DJX’s zone was 26500, and their intraday high, and so far, expiry high, back on Friday 5th was 26487. So, taking yesterdays close the DJX has lost 344-points, whereas, here in the SPX, it is down just 4.92-points. As we said “it just keeps banging on that (R2) door” and we even mentioned 2995, so really you just can’t get better than that. What we did get wrong however, was that the rollover and expiry wasn’t “next week” it is now next week. But worth noting that R2 is now 2925, but there is what we call a step-up at 2905, which was R2 in-between publications. The SPX has laid out its stall, and we believe it will still be sensitive to a still receding R2, so, for us, it all now boils down to the DJX, and the top of its zone, and the NDX. The fact that the rollover and expiry are large on the horizon also means this market is still very susceptible to anyone saying “boo”.